"Our kids played pretty well," said Lakers coach Steve Coury. "They really did a nice job." 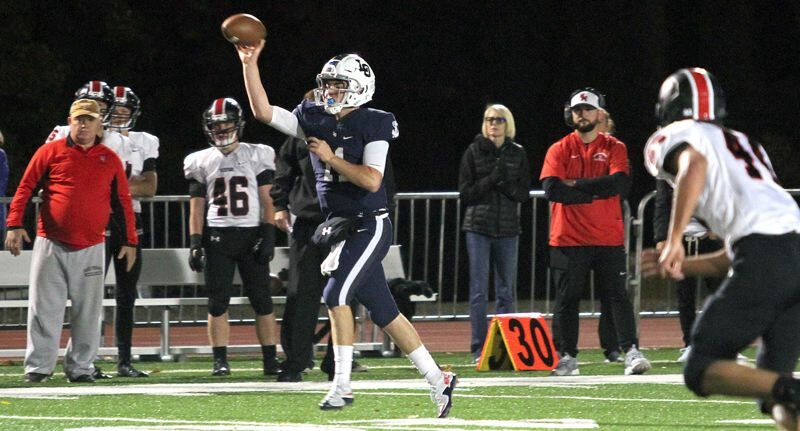 With the win — top-ranked Lake Oswego's seventh straight — the Three Rivers League champion Lakers improved to 10-1 and advanced to the state quarterfinals. There, Lake Oswego will host No. 8 Central Catholic — a 28-21 overtime winner over Tualatin on Friday — at 7 p.m. Friday. For more on that matchup, please see the accompanying story. No. 16 Oregon City, meanwhile, ended its season at 5-6 overall. The Lakers imposed their will on the Pioneers right from the get-go on Friday, scoring three unanswered touchdowns in the night's first quarter to grab a 21-0 lead. That stretch started with a 32-yard scoring strike from senior quarterback Jackson Laurent to junior wide receiver Thomas Dukart. Junior kicker Diyar Dezay added the first of seven straight extra points to give the Lakers a 7-0 lead. After that, senior running back Collin Bracken finished Lake Oswego's next drive with a 6-yard touchdown run, and Laurent stretched the LO lead to 21-0 when he hit senior tight end George O'Brien for a 22-yard TD. Then the Lakers really stepped it up in the second quarter, adding 28 more unanswered points to stretch their lead to 49-0 at the half. Senior running back Keenan DeRaeve opened the second quarter by capping a drive with a 14-yard scoring run, then following up with a 68-yard TD burst. Laurent came through again after that, hitting junior wide receiver Joe Hutson for a 36-yard touchdown pass. And finally, junior defensive end Marshall McGuire stepped up for the defense, scooping up an Oregon City fumble and racing 55 yards to score for that commanding 49-0 halftime lead. On a night when the Lakers rushed for 229 yards and passed for another 229, Coury had only good things to say about his talented offensive line — senior left tackle Tanner Hall, senior left guard Ryan Bertelsen, senior center Mo Linver, junior right guard Cody Carlson, senior right guard Asher Corbett, junior right tackle Tiger Shanks, and McGuire and O'Brien at tight end. "They're the unsung guys, but they do a hell of a job up there," he said. The evidence of that group's success was on the scoreboard and on the stat sheet. On a night when leading rusher junior Casey Filkins rested a minor leg injury, DeRaeve carried seven times for 133 yards and two scores and Bracken — who left in the first half with an elbow injury — added seven carries for 48 yards and another TD. Also noteworthy was Laurent's devastatingly efficient and effective performance. The senior quarterback completed 13 of 17 throws for 229 yards with three touchdowns and no interceptions. "(He) just continues to play at an unbelievable level," Coury said. "He's as good as we've had, including guys who've gone to major (Division I) colleges. He's like having another one of us (coaches) out there on the field." Regarding his efficiency, Laurent has completed 68 percent of his throws this year with just two interceptions in 11 games. "He's really just been phenomenal," Coury added. "I told him 'If you don't beat yourself, you're hard to beat.'" Oregon City's two scores came in the fourth quarter, the first on a 1-yard run by quarterback Colby Iverson and the second on a 7-yard Iverson pass to Jahleel Heath. For the game, Laker senior tight end Chris Todd caught four passes for 73 yards while Hutson made three grabs for 65 and Dukart four for 63. For Oregon City, running back Hunter Manassero carried seven times for 59 yards and Zakayas Dennis-Lee 10 times for 58 more. Iverson went 8 of 19 passing for 116 yards and one TD, with Matt Peterson catching two passes for 42 yards.